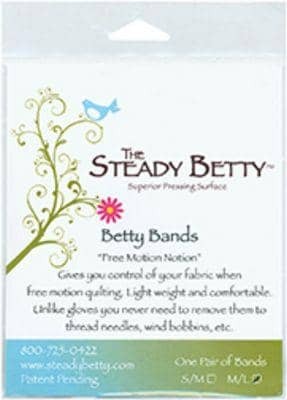 Betty Bands give you control of your fabric for precision workmanship when free- motion quilting or for any sewing that could use more control and comfort. Unlike gloves, these lightweight bands wrap around your palm so you never need to remove them to thread needles, wind bobbins, etc. So comfortable you will not want to take them off! Package contains 1 pair adjustable size extra-wide medium/large Betty Bands.